S.K.A.R. SPECIAL FORCES TROOPERS- BLOOD FOR THE BARON!!! 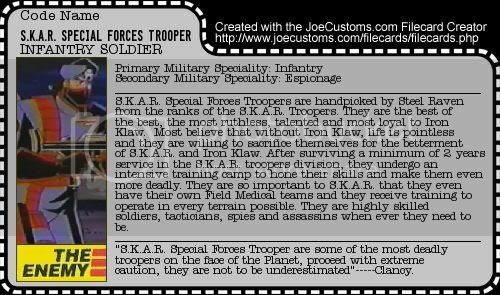 In Season 2 of GI JOE EXTREME the original S.K.A.R. troopers ( which are declassified here : ) in the brown uniforms with the skull face mask are replaced with these special forces soldiers. While I did like the S.K.A.R. troopers these special forces troopers are a big improvement. Not only is thier uniform cooler looking with the colors and design as major improvements but its more realistic too. Well you can sure say the S.K.A.R. is definately a equal opportunity Terrorist Group, and you gotta love them for that. With Steel Raven, Steel Talon, and the host of other females that show up on SKAR forces its nice to see they dont discriminate. I loved seeing all the female Special Forces Troopers show up and take center stage in episodes like "Metal Head Goes A.W.O.L." and "Sabotauge in the Sky". S.K.A.R. TROOPERS even have thier own Field Medical Response troopers as well. Thus showing thier importance to S.K.A.R. Like Steel Ravens uniform in season 2, their design reflects Iron Klaws own uniform and gives a more coercive look to the forces of S.K.A.R. Cool, i always liked the Skar troopers in Gi Joe Extreme. Ye, these guys have a Cobra kind of look to them. steve2477 wrote: Ye, these guys have a Cobra kind of look to them. steve2477, A major cobra look. Yeah, The shadow are good. But They stand no mach for COBRA!